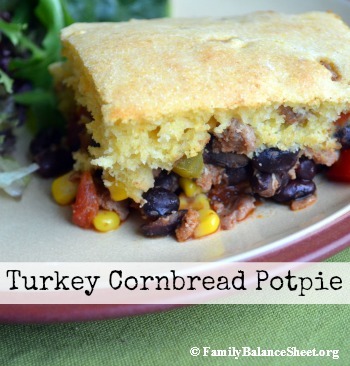 If you are looking for a fast, easy, kid-friendly meal, then Turkey Cornbread Potpie is just what you need in your life! This hearty casserole has been a staple weeknight dinner at my house for years. Serve with a garden salad and homemade applesauce. Enjoy! Cornbread topping ingredients:- You could use a boxed mix if you have it in your pantry. 1 cup buttermilk. No buttermilk? No problem! Make your own buttermilk. Break up the turkey and cook until no longer pink. About 5 minutes. Add chili powder, cumin, oregano, salt, tomatoes, beans and corn. Stir together and cook for about 3 more minutes. While the filling is cooking, start prepping the topping. Combine flour, cornmeal, sugar, baking powder, salt, and baking soda in a bowl. Mix together the buttermilk and egg and add to the flour mixture. Stir together until moist. Pour the turkey filling into a 13 X 9 baking dish coated with cooking spray. Spread the cornmeal mixture over the turkey filling. The cornmeal mixture is thick, but it should cover the majority of the turkey. Bake at 425 degrees for 18 minutes or until the topping golden brown. I make something like this and my family loves it. I use beef though. I like your version, because it is a bit different. Thanks for sharing it. This looks really yummy. I like all the high fiber foods in this recipe. I’ve never tried potpie with turkey like that. Thanks for the idea!! Thanks for the visuals. This looks really good. I love cornbread. Stopping by from dbg. Made this tonight and it turned out great! I added two tablespoons of canned diced green chilies and instead of making the cornbread from scratch I used one box of ‘Jiffy Corn Muffin Mix.’ Super easy meal and it tastes great!